The smart education and learning market in the ASEAN region is rising due to government initiatives towards digitizing education, increasing use of smartphones and tablets, internet penetration and developed information and communication (ICT) infrastructure. Virtual reality-infused classrooms and cloud-based smart education and learning solutions are gaining heightened popularity in the region and are becoming a standard across many educational institutions in countries such as Malaysia, Thailand, and Singapore. Transparency Market Research estimates that the ASEAN smart education and learning market holds immense growth potential in the near future. The market is expected to exhibit a remarkable 19.7% CAGR over the period between 2016 and 2020. If the prediction holds true, the market is expected to rise from US$36.84 bn to US$88.97 bn by 2020. The ASEAN smart education and learning market has been segmented on the basis of delivery model into classroom-based, desktop/mobile-based and simulation-based solutions. Among these, the desktop/mobile-based segment was the leading segment, occupying approximately 67% of the market share in 2015. It is also expected to remain the leading segment throughout the forecast period. However, the segment is expected to lose prominence to the simulation-based delivery model in terms of the rate of growth over the period between 2016 and 2020. The segment is expected to exhibit a CAGR of 21% over the said period. This up-and-coming segment will, however, still be able to occupy a very small share in the market pie owing to the dominance of desktop/mobile-based and classroom-based smart education and learning solutions. The segment of classroom-based solutions is projected to see a decline in its share in the overall market by the end of the forecast period owing to the rising demand for simulation-based smart education and learning solutions. The ASEAN smart education and learning market has been examined for seven regions: Malaysia, Philippines, Indonesia, Singapore, Thailand, Vietnam, and Rest of ASEAN (Cambodia, Laos, Myanmar (Burma), and Brunei). Malaysia currently leads the ASEAN smart education and learning market, accounting for a dominant share of 36.9% in 2015. The highly developed state of the information and communication technology (ICT) and vast penetration of smartphones have bolstered the Malaysia market for smart education and learning. Furthermore, government initiatives toward promoting the use of technology in education have resulted in the increased use of smartphones and desktops in delivering smart education to learners in the country. The market for in Malaysia is projected to remain the dominant regional market in the ASEAN smart education and learning market throughout the forecast period as well. Malaysia, along with Indonesia, is also expected to be one the most promising regions in terms of rate of growth of the smart education and learning market over the next few years. Both the countries are projected to exhibit a 20.3% CAGR over the forecast period. The launch of the ASEAN Economic Community (AEC) has bolstered the demand for English language courses in Indonesia. Additionally, high smartphone penetration and government initiatives towards delivering digitized education have further added to the growing market revenues in the smart education sector in Indonesia. The key market players operating in the ASEAN smart education and learning market include Blackboard, Inc., Educomp Solutions Ltd., Cisco Systems Inc., Adobe Corporation, Scholastic Corporation, Smart Technologies Inc., NIIT Ltd., Saba Software Inc., Scholastic Inc., and Extramarks Education Pvt., Ltd. The “ASEAN Smart Education and Learning Market” report provides analysis of the ASEAN smart education and learning market for the period 2014–2020, wherein the years from 2016 to 2020 is the forecast period and 2015 is considered as the base year. The report precisely covers all the major trends and technologies playing a major role in the smart education and learning market’s growth over the forecast period. It also highlights the drivers, restraints, and opportunities expected to influence the market growth during this period. 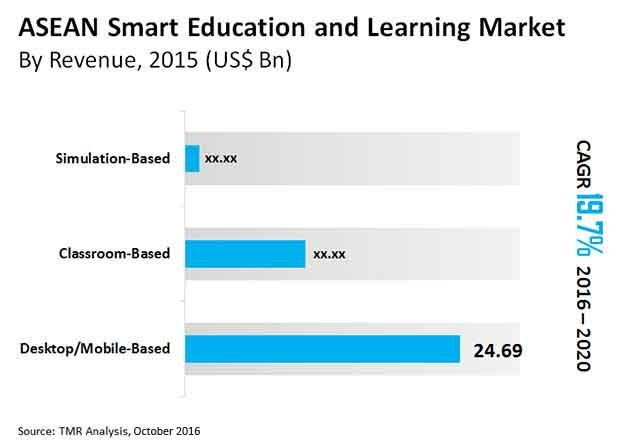 The study provides a holistic perspective on the market’s growth in terms of revenue (in US$ Bn), across different smart education and learning delivery models and end-uses. The market overview section of the report showcases the market’s dynamics and trends such as the drivers, restraints, and opportunities that influence the current nature and future status of this market. Moreover, the report profiles the key players in the ASEAN smart education and learning market and provides the overview of various strategies adopted by them and analyzes their behavior in the prevailing market dynamics. Based on delivery model, the report segments the ASEAN smart education and learning market into classroom-based, desktop/mobile-based and simulation based. Majority of the countries in the ASEAN region have a high rate of smartphone penetration. This has led to the increased use of smartphones for learning purposes. Additionally, most of the ASEAN countries have access to high speed internet connections. This further facilitates the ease of using smartphones for education and learning purposes. As a result, the desktop/mobile-based segment is the largest segment in terms of delivery model. Application of virtual reality in classrooms and the use of smart tools for learning are contributing towards the growth of the simulation-based and classroom-based delivery models. However, high initial costs and maintenance costs are hindering the growth of these segments. On the basis of end-use, the ASEAN smart education and learning market has been segmented into higher education, transnational education, technical vocation & technical education (TVET), language training (English), early childcare & pre-school, continual professional development, and qualifications, assessment & standards. Owing to the wide scale popularity of Massive Open Online Courses (MOOCs) for their diverse courses that are offered by various international universities, transnational education is one of the fastest growing segments in terms of end-use. Furthermore, there is a growing demand for English language learning courses to increase one’s employability as English is the official language of the ASEAN Economic Community (AEC). In terms of country, the ASEAN smart education region has been divided into Malaysia, Philippines, Indonesia, Singapore, Thailand, Vietnam and Rest of ASEAN countries (Cambodia, Laos, Burma & Brunei). Of these, Malaysia has a huge demand for English language learning courses and higher education courses. It is the largest segment as of 2015 in the ASEAN smart education and learning market. Malaysia is followed by Indonesia in terms of revenue share as a result of the developed state of ICT infrastructure in the country and availability of high speed internet. Additionally, high rate of smartphone penetration and the launch of AEC are also contributing factors towards the growth of the smart education and learning market in these countries. The report segments the ASEAN smart education and learning market on the basis of various delivery models such as classroom-based, desktop/ mobile-based and simulation-based. On the basis of end-use, the ASEAN smart education and learning market has been segmented into Higher Education, Transnational Education, TVET, Language Training (English), Early Childcare & Pre-School, Continual Professional Development, and Qualifications, Assessment & Standards.